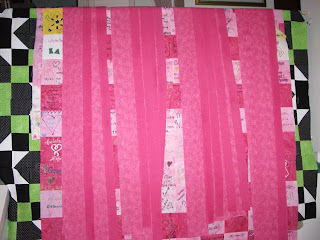 I'm happy to say I made some real progress this weekend on the breast cancer quilts. It's amazing what a rainy weekend will do for a crafter :-) I started thinking about my heart corner blocks. 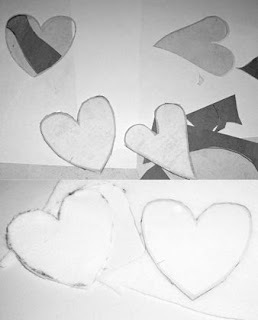 I created an applique heart in the embroidery software to sew out. 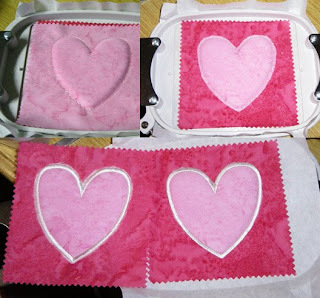 I experimented to see what it would be like if the heart were puffy applique using Pellon fleece as stuffing. I layered the Pellon fleece and top fabric on top of the sewn outline and trimmed after the second sewn tracing. I found it extremely difficult to trim the Pellon fleece and fabric in the applique. So.. I printed out the embroidery design and taped to some cardboard to make a template. I precut my Pellon fleece and top fabric before I went to the embroidery machine and it was so much more faster and cleaner. I have 7 of the 12 blocks needed completed. It's hard to see the dimension of these blocks. You can see it best in the right photo, top left corner. I know I'll be revisiting this process around Valentine's Day!! I was also able to cut both border fabrics strips, sew the strips together and iron all of them. I figured out that this was 1056" or 88' of sewing and ironing!! Once I finish all the corner squares, it should be fast sewing for adding the borders. I have just returned to look at your blog once again Trish: It's a great blog and if I can figure out how to post you back on my blog I will recommend them to take a look.